If your gum tissue has receded as a result of periodontal disease, then you may want to see our periodontists for gum grafting. We can restore lost gum tissue at Precision Periodontics & Dental Implants and protect the exposed tooth roots from decay. Schedule an appointment with Dr. Ryan Mendro and Dr. Lucia Roca Mendro if you would like to receive gum grafting in Winter Garden, Florida. One of the most advanced treatments we offer for gum recession at Precision Periodontics & Dental Implants is the Chao Pinhole® surgical technique. 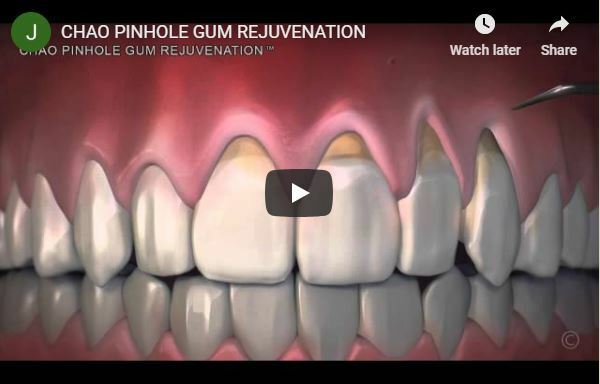 With this procedure, our periodontists can cover and protect the exposed tooth roots with healthy gum tissues”to ” An alternative to traditional gum grafting procedures is the Chao Pinhole® surgical technique. With this procedure, our periodontists can cover and protect the exposed tooth roots with healthy gum tissues without the use of any scalpel or stitches or using any gum tissue from the roof of your mouth”. The Chao Pinhole® technique is a procedure used to correct gum recession. Gum recession may occur as a result of a number of factors, including periodontal disease, tobacco use, hormonal changes, genetic susceptibility, insufficient dental care, or overly aggressive tooth brushing. These factors can all cause the gum tissues to recede, exposing more of the tooth structure and tooth root. Receding gums can lead to gaps or “pockets” forming between the teeth and the gums, which is makes it easy for disease-causing bacteria to accumulate and affect the teeth and gums. Without proper treatment, gum recession can result in severe damage to the tissues and bone, and it may even lead to tooth loss. In order to prevent these serious consequences and to keep your smile healthy, our periodontists may recommend the Chao Pinhole surgical technique. Pinhole surgery is a scalpel-free and suture-free way to correct gum recession. In this treatment, our periodontists creates a small hole in the gums using a needle. We then use specially designed instruments to gently loosen the gum tissue and slide it back over the area of the tooth where the gums have receded. Because this treatment does not require any cutting or stitching, it involves minimal discomfort during and after the procedure. The Chao Pinhole technique also gives you an immediate cosmetic improvement! We welcome you to contact our friendly office today to learn if the Chao Pinhole surgical technique is right for you and to schedule your next appointment with our team.